Laugh, climb, swim, and play on our unique floating track in Cozumel - it's one of the 20 amazing attractions included with admission to our water park. Featuring water trampolines, aquatic icebergs, and plenty of thrills to go around, our Floating Park is truly a unique attraction. 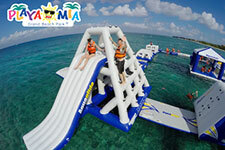 Laugh, climb, swim, and play on our floating track, and experience Caribbean Sea bouncing at its best. You'll be talking about our Floating Park long after you've returned from vacation. This one-of-a-kind, floating fun park is part obstacle course and part adventure circuit. Climb up obstacles and bounce across water trampolines. Accept the challenge of the aquatic iceberg - and then fall off into the water just for fun. You'll find a whole day of fun at our giant beach park. You can also upgrade your admission package to include add-ons like an international lunch buffet, open bar, jet ski rentals, snorkeling tours, parasailing, fish spa, and more. Make it the vacation of a lifetime. 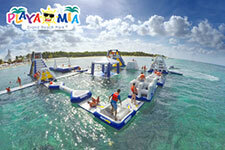 Experience Caribbean Sea bouncing at our Floating Park!